If interested, please contact Brad directly. Thanks! Brad Bollmann – What’s up! We recently caught up with DZP Rider Brad Bollmann, because we wanted to find out what he’s been up to lately. 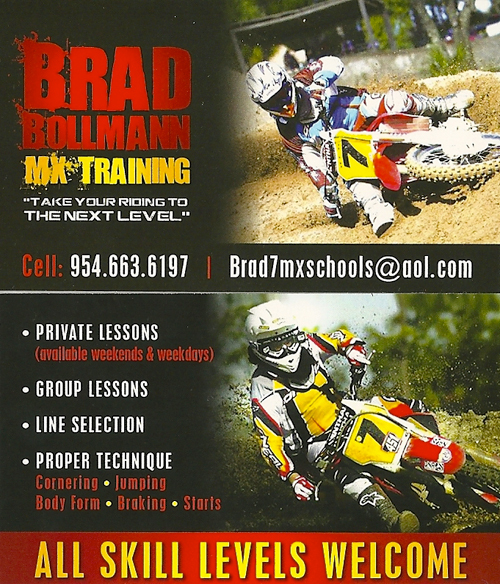 The Bollmann Family has been a main staple in South Florida motocross since their peewee days at Air Dania. Brad’s twin sister Alyssa also has raced since her peewee days! If you don’t know Brad or the Bollmann Family then you are missing out! Brad IS the most polite and caring person you would want to meet, but on the track, he is all business! Click Image - If you want to see a larger version. Erica: What have you been up to lately? BRAD: Whats up everyone! I know I’ve been missing in action. Well, for those who don’t know, I re-injured my knee at the Loretta Lynn qualifier. It was intended to be my first race back, just getting my feet wet again and getting back on the gate. I ended up over-jumping the big table single in the back of Seminole and ended up re-injuring my knee. So that’s where we stand now. As for what I’ve been up to, just graduated high school, been doing some vacationing and getting ready to start college here within the next month. Erica: Give us the info on your injury. BRAD: I tore my ACL. It’s a big ligament in your knee. I could ride with it torn but after years of that it’s not worth what comes in the future, which is an entire knee replacement. Surgery is scheduled for Tuesday, July 14th. 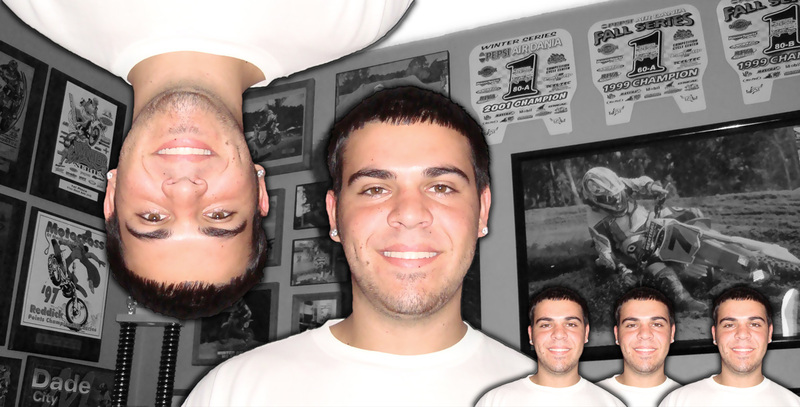 DZP: Update on the surgery – Talked to Brad and he is doing great, he has one more surgery scheduled in about 4 weeks. Erica: When will you be able to ride again? BRAD: This, I’m not sure of. I’m gonna do things a lot different this time around, seeing as it’s my second time tearing it. I’m gonna be hitting the gym a lot, getting back into shape and making sure this knee is at 110% before I step back on a bike. Erica: How do you plan on getting back into shape and what are your plans for staying competitive? BRAD: Like I said I’m gonna be in the gym a lot and working out hard until I get back on a bike. I can assure that when I do start riding I’ll be in the best shape I’ve been in on a bike. I’ve had A LOT of down time unfortunately and with any injury a rider sustains it gets he or she in a mental position where you just want it that much more and you come back stronger. That’s my plan. Also, I’ve been personal training on my spare time as well as doing small group training. Erica: Your family seems like a pretty tight knit crew – don’t you guys ever fight? BRAD: I got the best behind me! Really, if it wasn’t for my family I wouldn’t be where I am today. As for the the fighting, I mean all families fight and it’s either a mistake that someone on the team has made or it could just be one of those race days where I can’t get it together and it deserves a little piece of the entire crew’s mind. Haha. Erica: So, what exactly is DFB? BRAD: DFB was a riding crew I started back in the day. There are a few Florida crews and there’s a bunch throughout the States, but I think DFB is the realist! Hahaha. I Rep DFB all day every day! Erica: What are your future plans? College? Racing? BRAD: My future is gonna be busy. I’m enrolled in college and start classes in the fall. Racing is always gonna be something I do and these injuries aren’t gonna hold me back from achieving my goal, which is getting my pro license and racing with the big dawgs. Erica: Who’s your top pick for the pro outdoor series? BRAD: I’d like to see Grant win the 450 class that’d be cool. BRAD: For sure! The man’s got talent, let ‘em shine. Erica: Who would you like to thank? BRAD: I’d like to thank my Mom, Dad and my sister, P3 racing, GB works, Jack and the entire crew at Seminole Tribe Motocross, In-Motion Grafix’s, Shelley At DoubleZeroProductions and all the hard work she puts in, O’neal, Scott, RickCase Powerhouse, Rich Kid Clothing And anyone else I forgot, thank you. Erica: Thanks Brad, see you at the tracks soon!